The 2018 India-Russia summit may have turned out to be one for the ages. The stakes superficially centered on whether India would seal the acquisition of five S-400 missile defense systems from Russia for $5.43 billion. 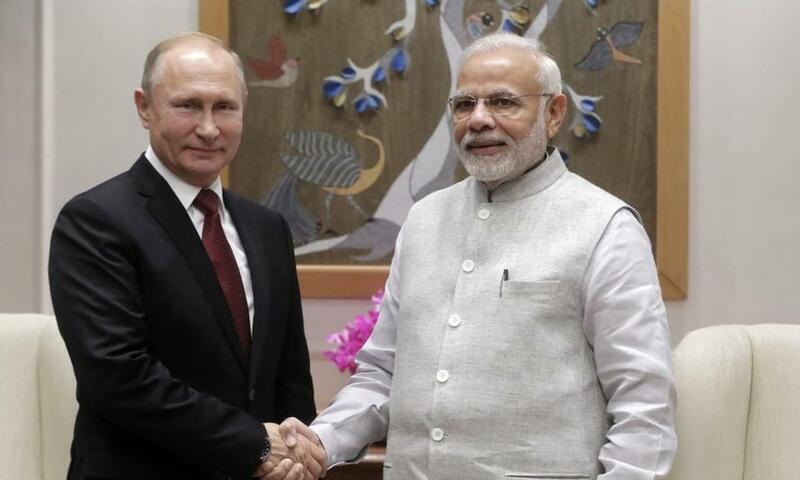 The deal was clinched immediately after Indian Prime Minister Narendra Modi and Russian President Vladimir Putin finalized their get-together in New Delhi. Negotiations started in 2015. The S-400s will be delivered in 2020. So what’s next? Trump administration sanctions against India under the Countering America’s Adversaries Through Sanctions Act (CAATSA)? This is a weapons deal that involves Russia, India and China – a key, if not the key BRICS and Shanghai Cooperation Organization (SCO) triad. The new reality is that all of these BRICS/SCO members are now able to deploy the highly effective S-400s. But that does not mean that two of them – India and China – would necessarily have to deploy S-400s against each other in case of a unilateral attack. Putin was adamant to stress that Russia will turbo-charge bilateral cooperation with India not only in the SCO but at the UN and the G20 as well. Modi for his part reaffirmed both India and Russia favor a multipolar world. “Our goals” crucially include Russia and India in synch in terms of preserving the JCPOA, known as the Iran nuclear deal. An inevitable consequence is that India will not refrain from buying Iranian oil and gas, even if threatened with American sanctions. The Trump administration might even waive sanctions against India if – according to the National Defense Authorization Act – President Trump decides that New Delhi has not undermined US strategic interests by buying Russian missiles. The verdict, of course, remains absolutely open. New Delhi suggested last month the creation of a special economic zone (SEZ) for Russian business – on top of an already discussed “green corridor” for smoother trade. All that fits the framework of historically warm Russia-India relations. Yet the Big Picture is way more nuanced as it highlights the finer points of Eurasia strategic balance between the three big BRICS/SCO partners. Putin and Xi Jinping have already established that the New Silk Roads, known as Belt and Road Initiative (BRI) and the Eurasia Economic Union (EAEU) will be merging in multiple fronts. That would leave New Delhi as the odd partner out. India is not aligned with BRI and is frankly opposed to one of BRI’s flagship projects; the China-Pakistan Economic Corridor (CPEC). Nothing that could not be solved by Beijing, for instance, fine-tuning the CPEC route bordering Kashmir. Moscow and Beijing for their part are extremely aware that India may be used by Washington as a Trojan Horse to undermine Eurasia integration. Evidence to support it include the recent Communications Compatibility and Security Agreement (COMCASA) which de facto converts New Delhi into a US military ally; the new status of India as Washington’s only “major defense partner”; and India’s role in the Trump administration’s revival of the Quad (alongside Japan and Australia), something interpreted by Beijing as an attempt to encircle it in the South China Sea. The problem is the ultra-nationalist Hindus in Modi’s BJP party actually support encirclement and/or containment of China. The never enounced key reason is economics. Were India to join BRI, the BJP fears a Made in China onslaught would simply destroy Indian domestic industries, much as what happened to some industry sectors in BRICS member Brazil, China’s top trade partner in Latin America. What Beijing and Moscow want is for their comprehensive strategic partnership – and synergy – to advance a BRI/EAEU-led Eurasia integration process. It’s not clear this is India’s strategic priority. Washington’s strategic priority is quite clear: divide and rule, by all means, the BRI-EAEU-BRICS-SCO concerted drive for Eurasian integration and global multipolarity. So, with the S-400s a done deal, the ball really is in New Delhi’s court. A much vaunted, official “multi-alignment” policy still leaves the fundamental geostrategic question up for grabs; will India lean towards American-style Divide and Rule, disguised as Balance of Power, or in favor of a multi-polar drive for Eurasia integration?